WESTPORT — Each weekday morning, Lisa Wexler works as the Westport-Weston probate judge in Town Hall, but by 3 p.m. she’s out the door and on to her next endeavor — host of “The Lisa Wexler Show,” a daily radio program that runs from 4 to 6 p.m.
“As I’ve gotten older, I’ve learned about the left-right brain and how I need to be involved with everything I’m doing in order to feel happy,” said Wexler, who has lived in town for nearly 30 years. The common thread between all of her activities — from probate judge to radio host, author and advocate — is a passion for justice, Wexler, 58, said. As a kid growing up on Long Island, Wexler said she had an inherent motivation to advocate against injustice. “I have always felt incensed, angry and frustrated when I feel someone is being mistreated. I think that’s the essence of justice: fair treatment. It’s not always equal outcome, and it’s not equality. I’m talking about justice. People have the right to be heard and to be treated fairly,” Wexler said. In high school, Wexler participated in model Congress, and at Johns Hopkins University she studied political science. While attending law school at New York University, Wexler won the American Jurisprudence Award for excellence in constitutional law. As newlyweds, Wexler and her husband, Bill, lived in Manhattan, but moved to Westchester County, N.Y., when their son, now 31, was born. Then, the beauty of Westport and her husband’s love of Longshore beckoned the young family to Connecticut. “I moved to Westport in 1989, and shortly thereafter got admitted to the Connecticut bar and hung out a shingle and started practicing” in the area of trusts and estates, Wexler said. A daughter was born soon after, and over the years, Wexler delved into the community, serving on the Planning and Zoning Commission and Zoning Board of Appeals throughout the 1990s and as a trustee of the local Jewish Community Center. On the Zoning Commission, Wexler made it her mission to speak up for neighbors whose home values were threatened by potential developments. “The neighbors, unless they’re articulate, organized and wealthy, they don’t have a chance, so I felt it was my job on the P&Z (Commission) to stick up for people,” Wexler said. A midlife crisis left Wexler no longer happy just practicing law, so in 2006, she endeavored to get on the radio, first on Saturday mornings and then with her own daily show. Wexler hasn’t been off the air in 12 years. Her WGCH program has won several awards and included guests including Gloria Steinem and former Gov. M. Jodi Rell. “I wanted to talk about things that were not labeled injustices, sticking up for the little guy, giving a voice to the voiceless — like the animals, for example. I wanted to motivate and invite people to know what was going on,” Wexler said of her motivations to start a radio show. Local and national news make up the bulk of conversation on Wexler’s show, but she also does a regular segment with composer David Friedman to discuss culture and theater. She frequently brings on her sister, Jill Zarin, of “The Real Housewives of New York City” fame, because Zarin enjoys chatting on the show, Wexler said. In 2010, Wexler and Zarin co-authored a book, “Secrets of a Jewish Mother: Real Advice, Real Stories, Real Love,” with their mother, Gloria Kamen. As an attorney, Wexler said she loved practicing in Probate Court. “They call it people’s court for a good reason, because I felt everybody always got heard,” Wexler said. When the position of Westport-Weston probate judge came up for a special election in 2013, Wexler jumped at the opportunity, earned the endorsement of the local Republican Party and won. A year later, she was elected to a full four-year term and is running for another term in November. A little less than half the cases that come before her as probate judge involve issues of wills, trusts and estates. “Never fight over stuff. It’s just stuff. You can’t take it with you,” Wexler said, but said she’s adamant each person who comes before her court, no matter their opinion, feels listened to and heard. The other half involve mental health cases. Wexler said she travels to Westport’s St. Vincent’s Behavioral Health Services at least once a week to decide “commitments,” cases in which a patient, often with schizophrenia or bipolar disorder, wishes to leave the facility, but is barred from doing so by doctors. Ordering someone to stay at a mental health hospital is a deprivation of their civil rights, Wexler said, but she orders a patient to stay at St. Vincent’s if she finds convincing evidence the person is a danger to themselves or others, or is greatly disabled and there is no less-restrictive setting for them to be in. 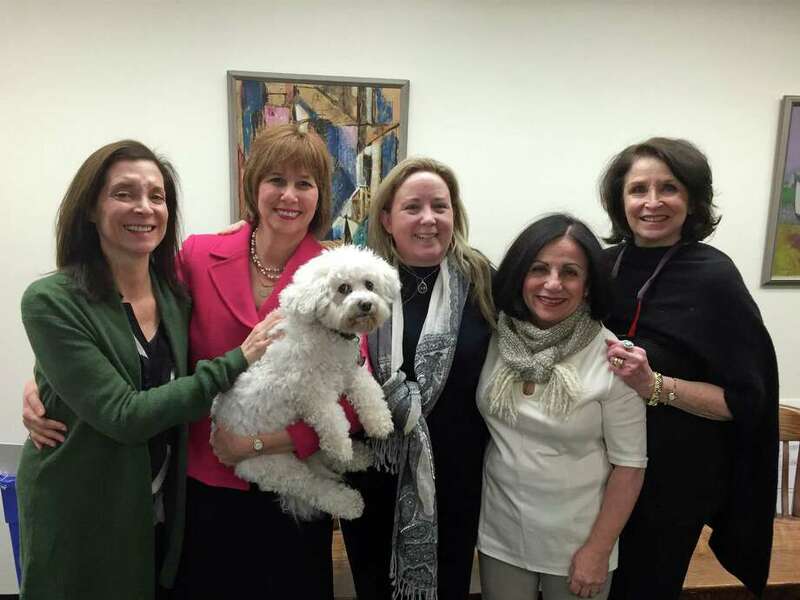 Guardianship, adoption and conservatorship cases also fall under her jurisdiction as probate judge, Wexler said, adding that her dog, Sugar, a bichon, joins her in all her hearings. “She humanizes all of the proceedings and really changes the tone of the courtroom in a beautiful way,” Wexler said. As much as Wexler gives to Westport, she said the town has given her more. “Westport is where I became a writer and where I became a judge. Westport is where I found my life,” Wexler said.